What is significant? 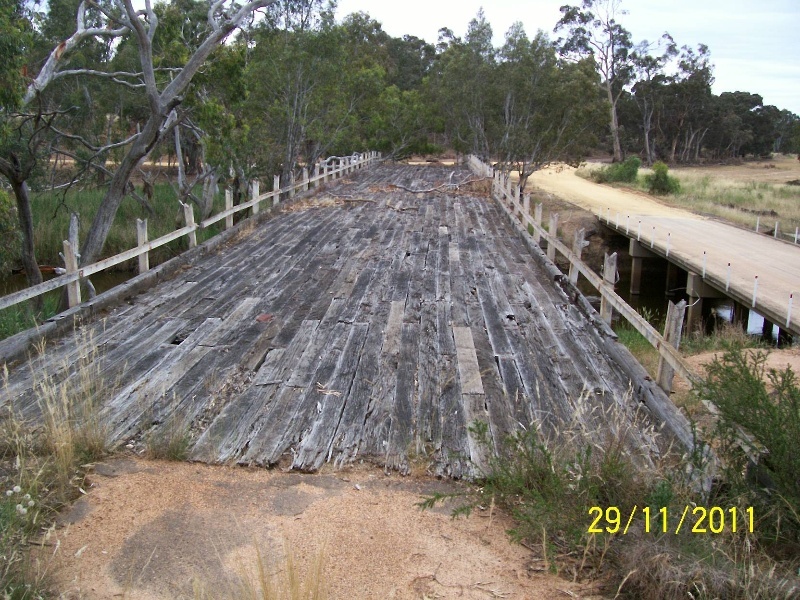 Archdale Bridge, constructed in 1863, is the oldest surviving timber bridge in Victoria. It has thirteen spans: the ten timber spans are between five and six metres in length, and the three main-channel spans with rolled steel joists are between nine and twelve metres long. The arching timber deck is 84 metres long and 5.5 metres wide. It has heavy hewn timber piers of between seven and nine piles, unusual geometric timber bracing, raker piles and huge cantilevered squared-timber 'caps'; the all-timber spans have shaped timber corbels over these caps. How is it significant? Archdale Bridge is significant for historic, technical and aesthetic reasons at the State level. Why is it significant? Archdale Bridge is historically significant as the oldest known surviving bridge built as all-timber. 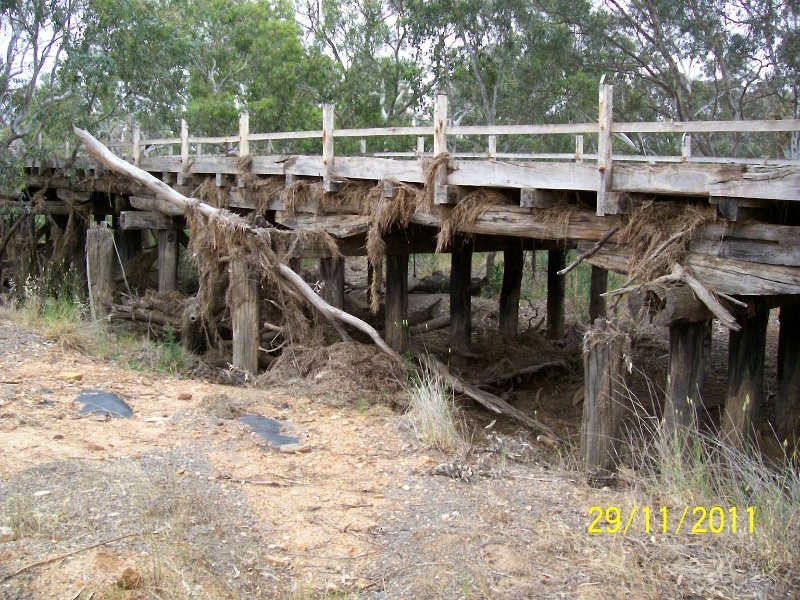 It is one of only two surviving Victorian timber river bridges to have resisted the record floods of 1870, the other being Ellerslie Bridge (VHR H1029). 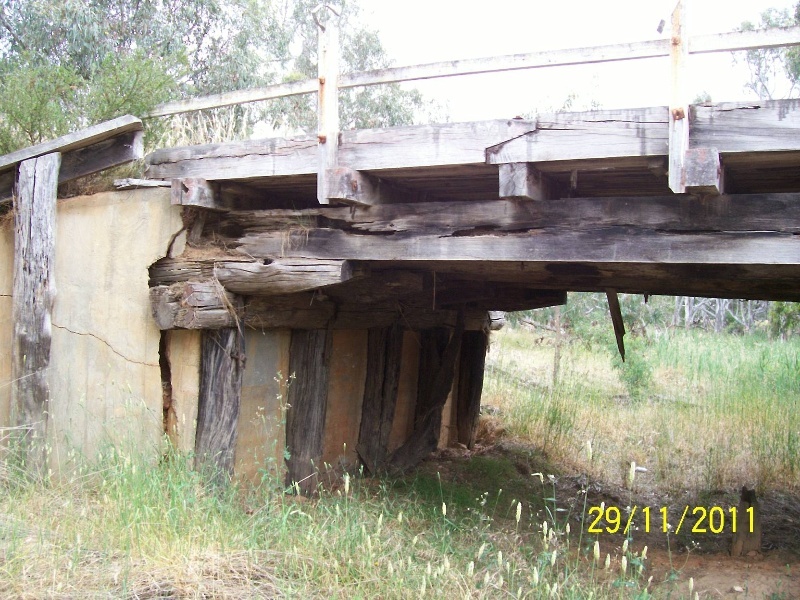 Archdale bridge is one of very few timber river bridges surviving in Victoria to possess large squared-timber pier 'caps', combining with squared and shaped corbels. Those heavy caps, over ten metres long, are cantilevered beyond the outer piles and fixed to the pile tops by mortis-and-tenon construction. They represent very rare examples of early bridge-carpentering traditions. Archdale Bridge is technically significant for its unusual piers with raker-piles, carefully-worked geometrical bracing, sockets for timber struts, and evidence of hewing by the broad axe. 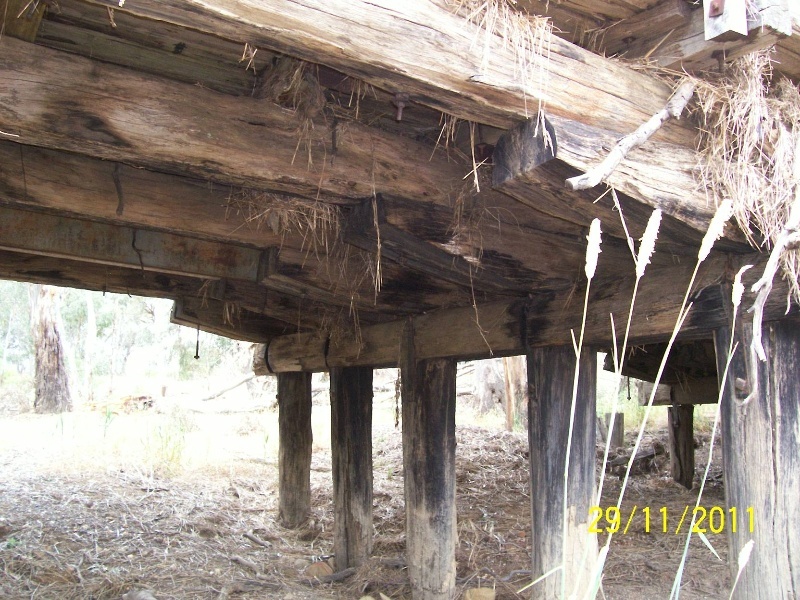 Ageing timber piles show clear evidence of having been shaped to take a strutted-stringer superstructure, of a type only built in Victoria prior to the economic Depression of 1892-3. Archdale Bridge is aesthetically significant for its unusual arching shape combined with an impressive and historic rough-hewn substructure. It is sited on anattractive rural river floodplain among numerous river red gums. Archdale Bridge has thirteen spans varying between two metres and twelve metres. The ten timber spans are between five and six metres in length, while the three main-channel spans with rolled steel joists are between nine and twelve metres long. It has heavy hewn timber piers of between 7 and 9 piles, unusual geometric timber bracing, raker piles and huge cantilevered squared-timber 'caps'. The arching timber deck is 84 metres long and 5.5 metres wide, and the all-timber spans feature impressive shaped-timber corbels over massive timber 'caps'. 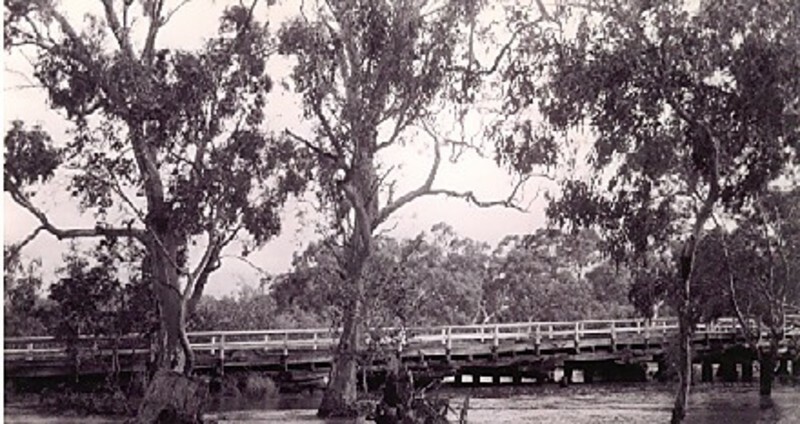 Archdale Bridge sits in a largely unspoiled natural river landscape, with river red gums. The new bridge adjacent provides views of the old bridge. It is uncertain from the surviving evidence whether the three main strutted-stringer river-spans of this bridge, modified to steel-joist structure in the 1930s, were originally of 'strutted-corbel' or 'strut-and-straining-piece' design. The oldest element in the current structure is undoubtedly the heavy hewn-timber substructure, which gives the big timber deck its distinctive 'humped' profile. The unusually-wide (over ten metres) big squared and cantilevered 'caps' that constitute the cross-heads of the piers, set this bridge apart. As their archaic style suggests, these huge 'caps' must belong to the original thirty-feet-wide superstructure of 1862-3, before the traffic-way was narrowed down substantially in 1903. Archdale Bridge is the oldest known surviving bridge built as all-timber. 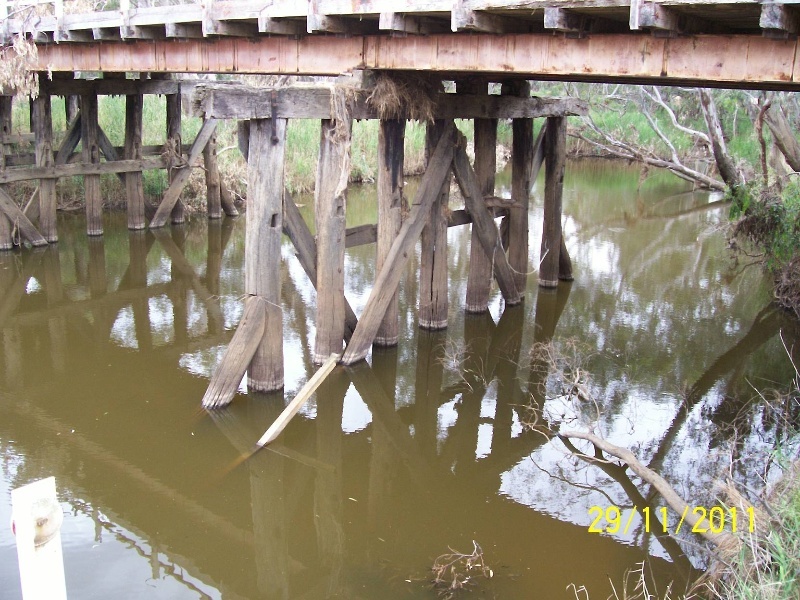 It is one of only two surviving Victorian timber river bridges to have resisted the record floods of 1870, the other being Ellerslie Bridge (VHR 1029). Archdale Bridge has a humped timber deck, designed to permit the ready flow of flood waters. Humped bridges were not uncommon in an era of horse-drawn vehicles, but were impractical with motorized vehicles; very few survive. Archdale Bridge has an unusual arching shape combined with an impressive and historic rough-hewn substructure. It is sited in on attractive rural river floodplain among numerous river red gums. Archdale Bridge has unusual piers with raker-piles, carefully-worked geometrical bracing, sockets for timber struts, and evidence of hewing by the broad axe. Ageing timber piles show clear evidence of having been shaped to take a strutted-stringer superstructure, of a type only built in Victoria prior to the economic Depression of 1892-3. The oldest element in the current structure is the heavy hewn-timber substructure, which gives the big timber deck its distinctive 'humped' profile. The unusually-wide (over ten metres) big squared and cantilevered 'caps' that constitute the cross-heads of the piers, set this bridge apart. As their archaic style suggests, these huge 'caps' must belong to the original thirty-feet-wide superstructure of 1862-3, before the traffic-way was narrowed down substantially in 1903.